The TRIPOD STRAP incorporates all the weight reduction qualities of OP/TECH USA straps. By combining the patented weight reduction system with OP/TECH USA's revolutionary Non Slip Grip™, the TRIPOD STRAP provides the perfect carrying vehicle for the busy photographer or birder. The intelligent design of the adjustment system allows the tripod to be carried with the camera, spotting scope or video in place. The versatility of OP/TECH USA's TRIPOD STRAP enables you to carry a tripod in a horizontal position by your side or in a vertical position against your back. The quick disconnects are the finishing touch which make the OP/TECH USA TRIPOD STRAP easy to attach or remove. The Non Slip Grip™ secures the strap snugly to your shoulder leaving your hands free to deal with other equipment or rough terrain. The swivel clip TRIPOD STRAP incorporates all the weight reduction qualities of OP/TECH USA straps. It is made in the same style as the S.O.S. strap, thus affording the same level of comfort. 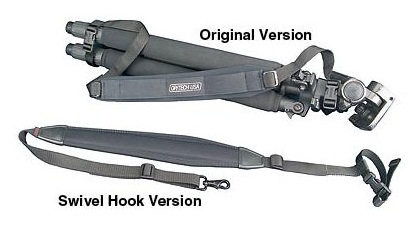 One end of the strap has a regular quick-release connector as on the regular tripod strap, the other has a swivel hook for attaching to tripods with this facility. The swivel clip end of the tripod strap will attach to tripods with a connecting ring near the head (such as the one shown) or at the bottom of the centre column, while the other end fastens around the centre column neck or a leg (or legs) or the bottom of centre column - the choice is down to your personal preference and comfort. The intelligent design of the adjustment system allows the tripod to be carried with the camera, spotting scope or video in place. The versatility of the swivel hook TRIPOD STRAP enables you to carry a tripod in a horizontal position by your side or in a vertical position against your back. The quick disconnect is a finishing touch which makes the TRIPOD STRAP easy to attach or remove from one end of your tripod. The Non Slip Grip™ secures the strap snugly to your shoulder leaving your hands free to deal with other equipment or rough terrain.